It’s rare for me to have a case of the moan-days, since I love being able to spend the day with Liv. We’ll do the usual thing (play, read books, go on a fun adventure. meet up with friends or just take it easy) and yesterday, I only had one thing in mind that I really wanted to do: get some fall decorations up. It’s really weird to be putting up decorations two years in a row.. in the same place. I kinda like it. The only thing I still want to do is put tiny pumpkins in our fruit dish on the breakfast table. Other than that: done! I like to keep holiday decor fairly simple, but as far as Christmas goes, the Pilot said, “It’s on.” I think he’s still scheming from when we found out we live in Christmas neighborhood next to the Cranks. We were the Scrooge house with a single strand of lights, even though I loved them. 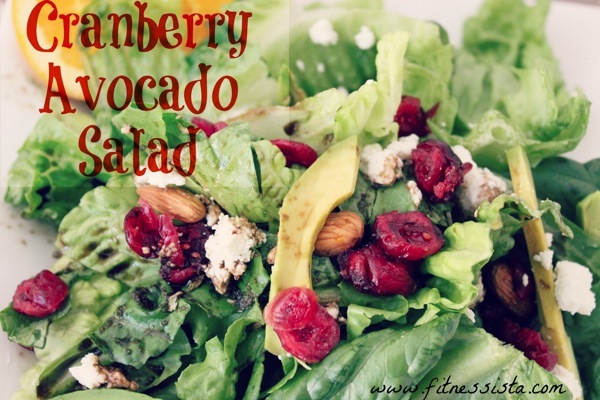 It seems like a surprising combo, but the sweet cranberries perfectly complemented the creamy avocado. It was especially amazing with goat cheese and orange balsamic dressing (isn’t everything better with goat cheese?). then made the dressing with a mix of balsamic vinegar, fresh orange juice, oregano, garlic, salt and a pinch of Stevia. 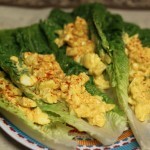 Festive, delicious and different- it would be great for a dinner party. Something to do: The Spooktacular Sweatfest workout! Get it. Beautiful decorations, and a beautiful lunch! I love that salad–it helps remind me that fall tastes don’t always have to be in the form of pumpkin cinnamon rolls or apple pie. We really should enjoy the bounteous harvest and get our fruits and veggies in their natural form. (Not that cinnamon rolls or pie are bad once in a while). I’m a military wife, too–I so know what you mean about putting up the same decorations in the same place two years in a row. Definitely looks fabulous! I’m loving your fall decor! I actually really like the wall color in your kitchen- it gives it some character 😉 Planning on trying out your spooctacular workout today! 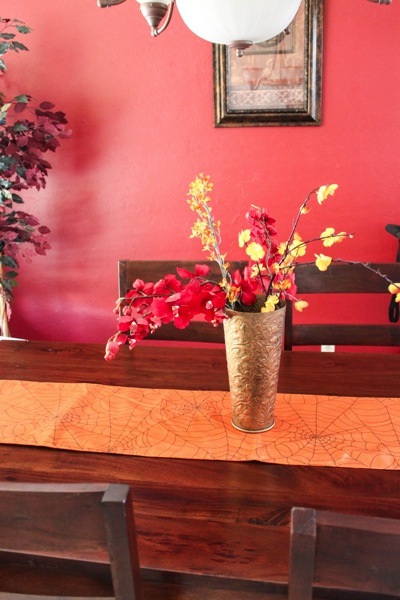 I love fall decorations, but we’re a military family, too, and somewhere along the way I got rid of all my holiday decor EXCEPT for the Christmas stuff. Boo. 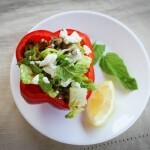 That salad looks amazing; now I know what’s for lunch! Love the decor and that salad looks yummy! I need to try that dressing combo! 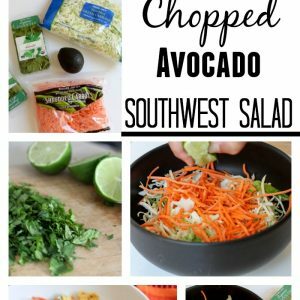 I’ve been dying to try avodaco! I had an allergic reaction a couple of times so I’ve been staying away lol but your salad looks great! 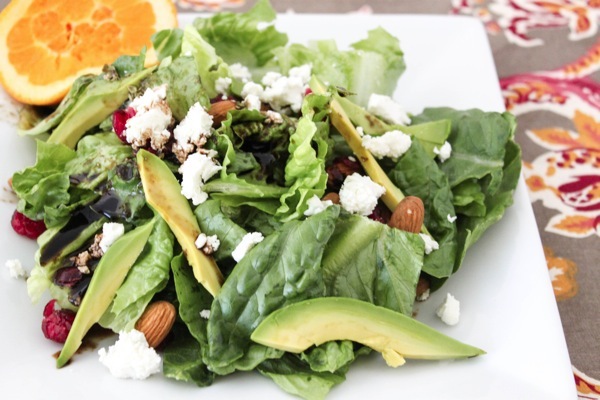 Loving that salad and dressing …. never thought to add orange to a dressing. I’m going to try that for tomorrow 🙂 Thanks for sharing! I’m pretty sure I’ve got all the salad ingredients, so it’s on! 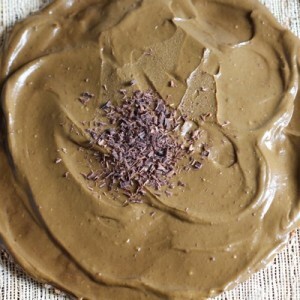 Today’s the hubby’s b-day–perfect timing for a fun, new recipe. I love the Halloween votive candle holder with the web in the back – really cool! I tend not to do much for Halloween but just put up losts of fall stuff that can carry over into Thanksgiving. I go way out for Christmas and since we just closed on our new house I’ll have my first actual house to decorate. I think we need a huge tree, tons of lights (I’m going to get carried away, for sure!). Love that combo! 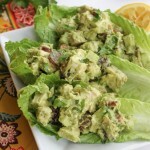 I use cranberry avocado with pecans. Must try with almonds now:) Love the decore, especially the the little candle holders. Cute! 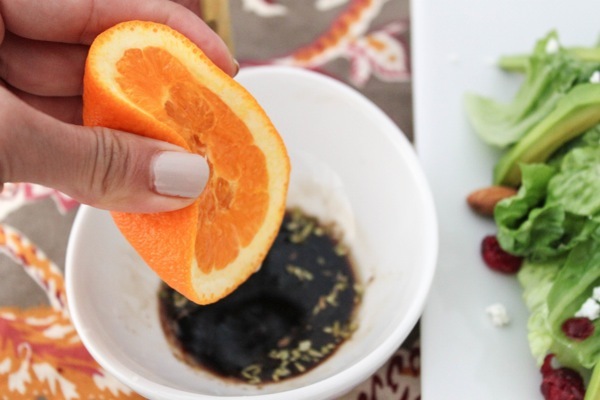 Balsamic vinegar, fresh orange juice, & cranberries can do no wrong! Looks like a great salad! Love the fall decor! It’s always fun to celebrate the seasons and holidays! That salad sounds amazing too! That salad looks amazing! 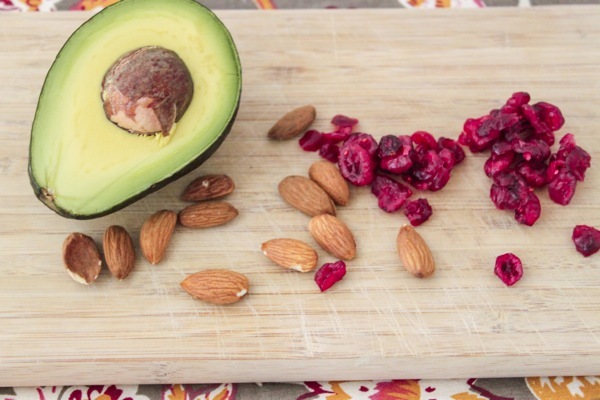 I must try the cranberry+avocado mix. 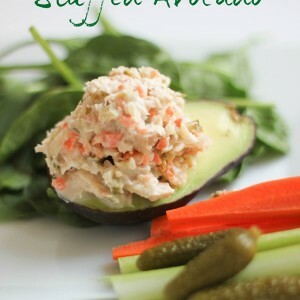 I think anything with avocado and goat cheese is delicious! Love your decorations! I wish I could do more Fall decor, since the colors at this time of the year are so beautiful, but I live in an apartment so storage space is pretty limited and mostly taken up by all of my Christmas decorations… Space or not, Christmas is one time that I definitely don’t skimp on. I never usually decorate too much for anything but Christmas, but I want every holiday/season to be fun to my little one so next year IT’S ON for me too. I have raisins instead of cranberries, but otherwise everything I need so I’m duplicating this lunch today! Hi Gina, I’m a long time reader and just wanted to know how you deal with unpacking your whole life in one house, decorating it beautifully, and then having to pack everything up and move in 1-2 years and start over again? I don’t know if you’ve ever addressed this, or maybe I’m clueless, but I give you some major props because that takes a WHOLE lot mentally. at first i had the mentality of “what’s the point, we’re just moving again.” but, i realized that we can end up in places much longer than anticipated, so might as well make the most of it! we were only supposed to be in valdosta for a year and a half, but were there for 4.
goat cheese is something amazing, seriously…..love it!! My favorite snack is the multi grain cracker thins at Trader Joes with the herbed goat cheese! Mm! 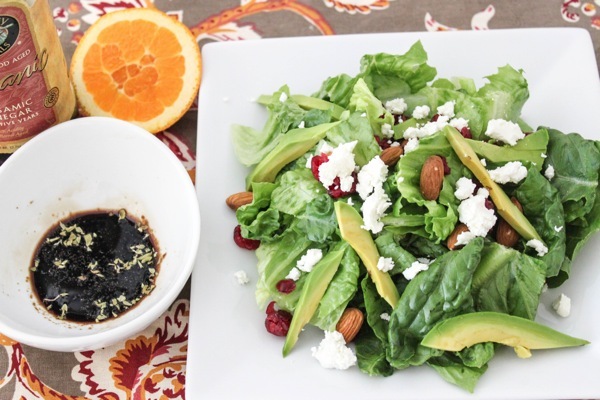 Orange balsamic sounds great. I never go toooo crazy at Halloween/fall for decorating, but when it comes to Christmas, that’s a different story. My husband hates it! 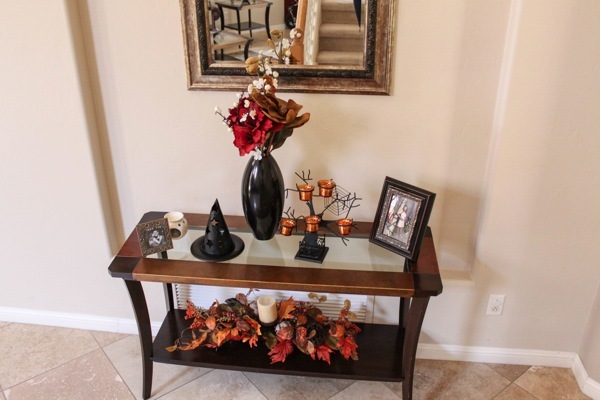 Loving the fall decorations in your house! 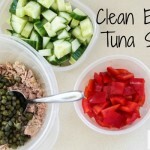 And I love the flavor combos in this salad, looks delicious! Love the decorations! It must be fun putting the same decorations in different places, but then again its probably fun to put them in the same place too! Yummy salad..I <3 avocado! 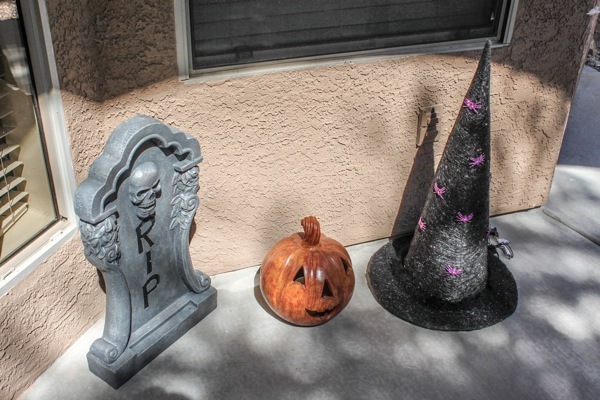 I love seasonal and holiday decorations; yours look great! Very festive 🙂 Your salad is SO pretty, and sounds delicious, too. It would look beautiful on the table for a big dinner party/ family dinner. Congratulations on being included in Fitness’ article! Yum, that pizza looks so good – I might have to make it for myself tonight! I love all the fall decorations. 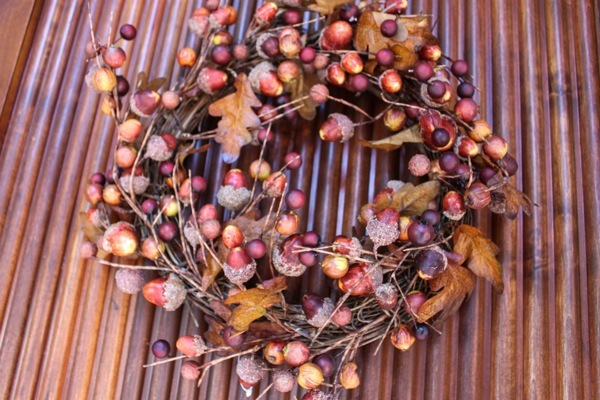 I have often thought about changing the decoration of the house depending on the season, but it is just another thing I have never got round to. That salad looks amazing! And your decorations are so cute! I loooove your cute fall decor! So cute! Your house always looks so nice and clean 🙂 That salad looks amazing.. I love cranberries in salad’s. Probably because I have a raging sweet tooth, but at least I end up eating more salad! My brother is a winemaker and has access to some seriously amazing oils and vinegars. Last Christmas I was gifted some blood orange olive oil and CHOCOLATE balsamic vinegar. I die, in the best way. Holiday decorations are the best! Yippee! Awesome salad! Dried fruit and goat cheese in salads is such a great combination. We moved in to our home this past April so I LOVE being able to collect items and know that I have a place to store them and be able to put them out year after year! I’m SO picky though! I was just thinking how this weekend would be perfect to get back in my garage (since the temps are dropping nearly 20 degrees finally) to organize boxes that have been there since I moved in in March. This reminds me to pull out my fall decorations box while I’m out there.